To view floor plans and a full description of the Garland, please Login. Contact us for an estimate to purchase this floor plan and to learn about contruction options available from local builders. More details available when you're logged in. Note: Floorplans and pictures may reflect optional features and are for illustrative purposes only. The above floorplans may vary slightly from the actual plans. Room sizes and square footage estimates are approximate. This information is deemed reliable but not guaranteed and is subject to change without notice. Floorplans, pictures and designs are copyrighted and cannot be copied or reproduced in any form without the expressed written consent of Simon & Simon Enterprises LLC. Used here under license from Design Basics LLC. 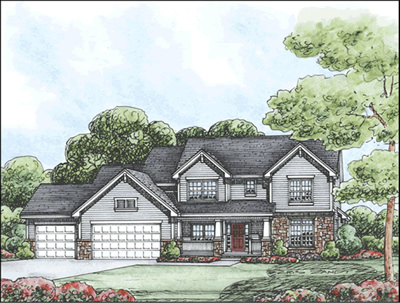 Send me more information about the Garland floor plan, design number 42034. New home financing experts can help you get the money you need to start construction on your dream home. The Garland floor plan, a Craftsman style home plan; design number: 42034 is approximately 2,646 square feet on 2.0 levels. This floorplan includes 4 bedrooms and 4.0 bathrooms. The total footprint for this floorplan is 72’ wide × 43’ deep. Use the contact form above to be connected with a new construction specialist today.